Luton Town’s FA Cup second round tie at National League side Gateshead has been switched to Sunday, December 3, with a 2pm kick-off at the International Stadium. The Hatters have received confirmation this afternoon about the fixture change from the FA, with the clash selected for extended highlights on the BBC. 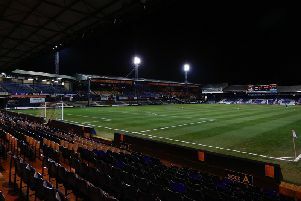 If the tie is level after 90 minutes, a replay will take place at Kenilworth Road on Tuesday, December 12 – dependent on TV selection – with a 7.45pm kick-off. Ticket prices for any potential replay will be as follows: Adults (21-65 years) – £10; Senior/Golden Senior/Young Adult (O65 or U21) – £5; Youth (U17s) – £2. The Checkatrade Trophy second round tie at home to either Swindon Town or West Ham United U21s will remain as scheduled for Tuesday, December 5, with a 7.45pm kick-off.